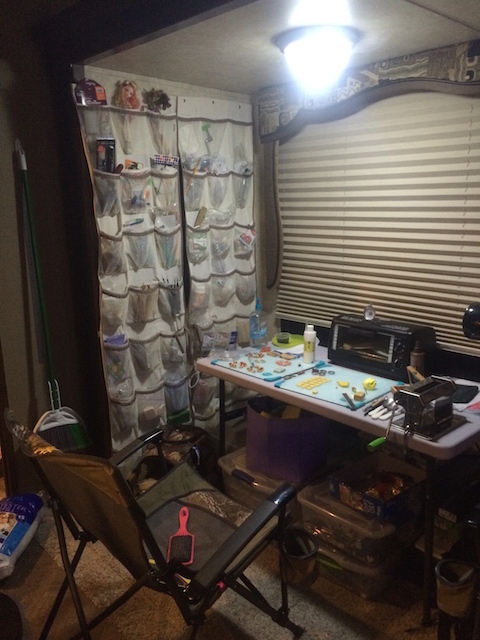 How to create a tiny ART studio for a RV? Living in an RV has a lot of challenges especially when you like to do crafts with your kids, have an art business or you just want a desk where you can work. The first step is to find an area in your small home that is big enough for a desk or table. I knew I needed a craft area so we chose a camper that had a super slide (a slide that basically one whole wall) and took out the couch and dinette. We use camper chairs for seating which works great on moving day, because we can put the bikes inside the slide. To make our Craft area (Munchy and I make polymer clay jewelry and art) we used velcro to adhere a shoe organizer to the wall. The velcro doesn’t work well with fabric so we used super glue to glue the fabric to the velcro. The idea was to make the pockets not super permanent so the next buyer could, hopefully, take it down if they wanted. I bought a table for our work space and then I used plastic containers to hold the rest of my supplies. My favorite purchase was 12×12 glass sheet used for quilting that has measuring lines on it. These work great when working with anything that is sticky, because you can take it off with alcohol. 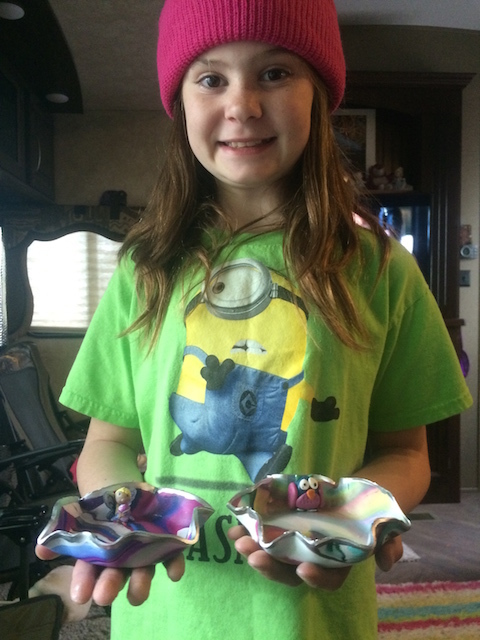 Munchy has worked very hard making lots of crafty things for her Barbie’s, Monster High and Ever After High dolls. Every couple of days she comes up with a new idea of what she wants to make. She finds a video on YouTube and then brings it to me to watch, then we put it on our schedule. She loves making birthday presents for friends back home, gifts for her cousins, aunt and grandmother. Here are some fun pics of all her amazing creations. We both have worked super hard and now have a store open on Amazon Homemade which is Etsy biggest competitor. We are very excited and hope that everyone takes at look. For an extra treat we are also included a sample of essential oils that you can add to your jewelry, and the seven-day Jamberry challenge. I have started selling both since we got in the camper to try to make a little extra money. Here are some of our jewelry. This entry was posted in Art/Music, Fulltime Tips and Tricks, Neat ideas, Unschooling and tagged amazon homemade, art, Art studio, Jewelry, polymer clay, RV tips by Chrissie. Bookmark the permalink.